Back pain manifests itself in many different forms, attacks without warning, and damages its victims’ physical and emotional health. Everyone suggests a different cure for the effects of a weak core: surgeons want to cut, chiropractors want to adjust, physical therapists want to perform physical therapy. In The End of Back Pain, neurosurgeon Patrick Roth, M.D., reveals that, more often than not, back pain is caused by a set of underdeveloped core muscles that control the stability and alignment of the spine that are not being used. He details a specialized exercise program to strengthen and develop those muscles to relieve, control, and even prevent chronic pain. The End of Back Pain helps patients view the body from a totally different perspective, and inspires readers to push their bodies in order to cure its maladies. After years of treating back pain, Dr. Roth has seen time and time again that a back that is not used to its full capacity is a back that is unhealthy. When we don’t use our backs, we are not utilizing the core set of muscles designed to help us stay strong, increase stamina, and look our very best. Patrick Roth, M.D., is the chairman of the Department of Neurosurgery at Hackensack University Medical Center and the director of the Hackensack neurosurgical residency program. He has authored numerous publications related to the spine and has been perennially included in the Castle and Connolly Top Doctors listing, as well as in New York magazine's Best Doctors issue and Inside Jersey's Top Doctors listing. His areas of focus include minimally invasive spinal surgery, rehabilitation of back pain, and exercise and diet. He lives in northern New Jersey with his wife and two children. Dr. Roth’s ‘stackable’ exercise program is designed to strengthen the muscles on all sides of the spine, providing an inner support structure to minimize back pain. If patients are willing to put forth the effort Dr. Roth prescribes, most will be able to take control of their back pain future. For those suffering from low back pain, Dr. Roth offers a unique program that combines the body and mind in a clear, thorough, and meaningful way. 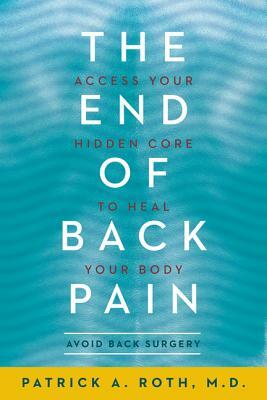 I highly recommend this book to any back pain sufferer who is interested in controllingtheir back pain. In fact I will make this required reading for spine fellow surgeons that train with us every year. Dr. Roth’s book addresses one of the greatest embarrassments of American Medicine, treatment of back pain. The current system rather than helping this epidemic condition actually acts as a co-conspirator through wrong counsel and practice. Dr. Roth’s book is the antidote to this mal-practice. The unique approach so clearly presented in Dr. Roth’s “The End of Back Pain” is an outstanding and simple way to conquer your pain and improve your quality of life. Understanding and treating your “hidden core” will assuredly help you as it did me.